Reblogged with permission from the Sonicbids Blog. You can read the original here. Every band has to start somewhere. Many groups playing the world’s largest stages today started in small clubs in and around their hometowns. But sometimes, it’s difficult to even get that far. When you’re at the very beginning, with no fanbase or connections whatsoever, how do you cut through the noise and get people to notice you? Social media is a great way to stay in touch with friends and fans you already have, but it’s becoming harder and harder to access new fans through it with so much oversaturation. Here are my tips on how a band with no fans or connections can get moving and start building a career. Other musicians are by far your strongest allies starting out. In the beginning, your best (and sometimes only) shows will usually happen through other bands, whether they asked you directly or referred somebody to you. So you need to get out there and make some friends! The easiest way to do this is by going to local shows. Use the power of the internet to hunt down bands in your area that you like a lot, regardless of whether or not they play the same kind of music as you. Then, get out there and see them live. When they finish their set, make a point to introduce yourself. DO NOT push your music or band on them from the beginning. Let it come up naturally in conversation, even if that means going to see them two or three more times. Otherwise, you’ll come off as pushy and might give off the impression that you’re just trying to get something out of them. Keep doing this with more and more bands. The world of music is small. You’re going to eventually find that some of the bands you’re friends with are also friends with each other. Book shows with those bands! Repeatedly! Keep going to see their shows, and they will (hopefully) extend you the same courtesy. Your audiences will eventually intermingle, and the ball will really start rolling. As a new band on the block, one of your first priorities should be creating a logo, font, and overall image scheme for the group that establishes its identity. Then, display that identity proudly for all to see! Yes, I mean posters. It may be the 21st century, but if people are intrigued by your band name and image, they will undoubtedly check out your music after seeing your logo plastered around town enough times. Anywhere that you see other posters, stickers, or advertisements is most likely fair game (just be sure to get permission if you’re putting something up in a business). Even if you have nothing to promote, posting your name and image everywhere will establish your band in the minds of all who see them. Ideas for digital and print promotion from our DIY Touring course. Weekly open mics are another great way to gain visibility. Find one that occurs in a venue you enjoy, and show up every week to play a short, stripped-down version of your set (treat it like a preview). Use these as a chance to establish a relationship with the people that run the business, as well as the regulars that inhabit it. If you can’t find a decent, frequent open mic in your town, street performances will do the job as well. Find a spot you like (depending on the rules and regulations of your city), and show up regularly. Be friendly and talk to people walking by. A strong and personable impression is a memorable one, and sticking in people’s minds is the first step towards building a fanbase. Playing live often is, for obvious reasons, a vital component of being visible and building a fanbase. The bands I was in that have generated the most consistent buzz were gigging on a weekly or bi-weekly basis in the beginning. In general, a bi-weekly gigging schedule is a good goal. That doesn’t mean, however, that you should take every single gig that comes your way. It’s important to be smart about where you’re appearing and when. It can be dangerous to play too often in one place. Doing so will tire out your audience in that area and makes your appearance much less special. So gig often, but spread them out geographically. If you live in a large metropolitan area, make it so you’re only playing the same part of town once every six weeks or so at most. In smaller towns, reach out to venues in adjacent towns and make the trip. Yes, this could involve a lot of travel, but it will pay off in the end, as you are reaching new fans consistently while keeping the interest of your current ones. Tips for reaching out to venues from our DIY Touring course. 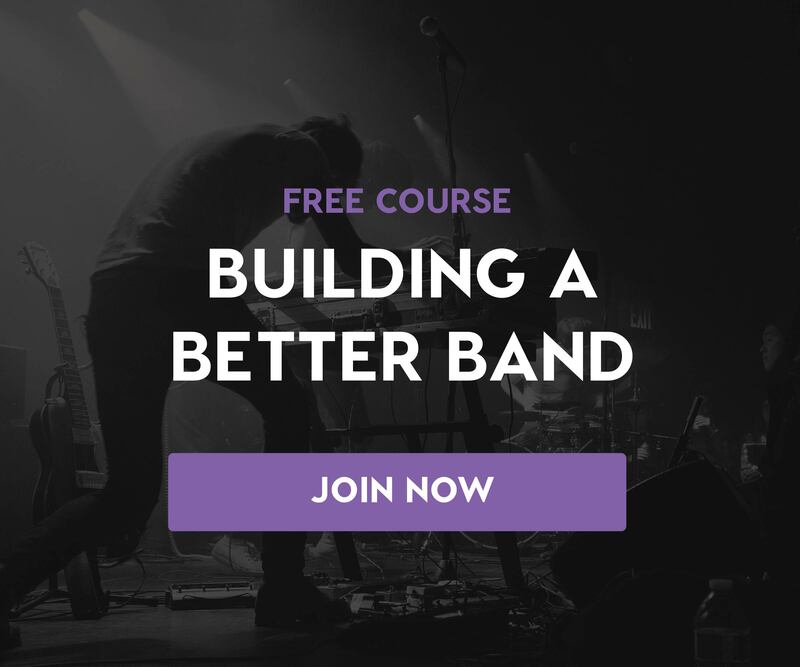 I’ve already covered the importance of meeting other local musicians, but there are other key contacts you want to make as time goes on if you want to continue building your audience. Local radio hosts, news/blog writers, promoters, sound engineers, and club owners are all important parts of the equation, and are the kinds of people you want to get to know as soon as possible. Though it’s true that some of these people don’t have a lot of time for an artist who’s just starting out, you’d be surprised at how friendly many of them are. Start by hunting for a radio DJ or blog writer that you really enjoy (even better if they focus on local talent), and reach out to them with a simple, professional, and friendly email. Introduce yourself, and explain how much you enjoy their work and what you like about it. Again, don’t be too pushy with your music, but offer them a free ticket to your next show (even if you have to buy it yourself), and thank them generously. Make sure that you put the emphasis on making friends with them, rather than focusing on what they can do for you, regardless of who it is or what you’re pitching.